Adding educational experiences along with travel is something we strive to do. While on a recent road trip to Savannah, Georgia, one must-see stop on my list was, Old Fort Jackson. Without a doubt, I knew the boys would enjoy the daily cannon firings and interactive programs that are offered. What’s not to love about Savannah? Our family enjoys stopping in for a visit when we can to take in the beauty. A city that’s filled with monuments, fountains, parks and history. If that’s not enough driving 10 minutes out of the city will land you at Old Fort Jackson. 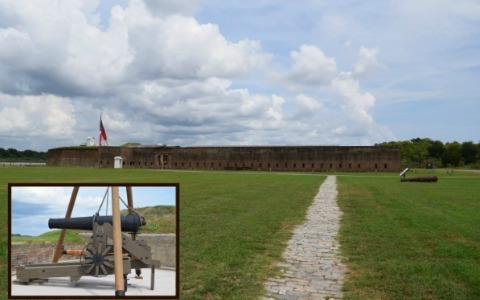 Old Fort Jackson is one of the oldest brick fortifications on the East Coast. During you’re visit you’ll experience history coming to life. All while taking in the unique views of Savannah’s riverfront. Being a National Historical Landmark, Old Fort Jackson is run by volunteers, and is a must-see while in the area. We visited Old Fort Jackson in the off-season and through the week. We very much enjoyed the commentary, as well as the performance of the Confederate army reenactor. I love how they make sure to interact with the audience by getting volunteers to help demonstrate how quickly he could load and fire the Civil War era muzzle-loader. Throughout the performance, we learned a great deal of the fort’s history, and even some history of Fort Pulaski National Monument. This performance ended with the loading, aiming and firing of the howitzer (black powder only). After the Civil War muzzle-loader demonstration, we then headed to watch the firing off of the cannon. The daily cannon firing times are 11:00 am and 2 pm. Since these times can change without notice, you may want to call ahead. At this point, we learned quit a bit as well. After completion of the demonstration, we headed out to explore the fort on our own. Our family had such a wonderful time at Old Fort Jackson. The boys were currently learning about the Civil War in our homeschool, and visiting here helped bring it to life. There is so much to read and see as you go throughout the fort. We picked the perfect day to go. It was overcast and a slight breeze was blowing. It helped that we went during off-season to beat the crowds. We were able to take our time and enjoy the experience. • Arrive early so you’ll have plenty of time to take in all the sites. We spent around 3 hours total during our tour. • They are open 7 days a week from 9am-5pm. They are closed for Thanksgiving, Christmas Eve, Christmas, and New Years Day. • Admission is $8 for adults and $4 for children 2-12.